"Your Past is What Makes You Who You Are." For nearly four decades Jaclyn Smith has held the public’s interest as an award winning actress, a designer and a role model. She loves her family, her home, gardening, Tchaikovsky, baseball, “Gone with the Wind”, her mother’s cooking – and her dogs. She manages her life and legendary career with grace and style. A native of Houston, Texas, Jaclyn put on her first pair of dancing shoes at the age of three. She studied drama at Trinity University and she was soon in productions of “Bye Bye Birdie”, “West Side Story”, and “Gentlemen Prefer Blondes”. She left Texas to pursue her dream as a dancer. While in New York, an agent believed her classic beauty made her a natural for television cameras and Jaclyn Smith soon came into American homes as the Breck Girl, which led to relationships with Wella Balsam and Max Factor. While with Max Factor she developed a new scent, Jaclyn Smith’s California. Her signature scent won best mass produced fragrance the year it was launched in 1989. Hollywood beckoned, and before long she was appearing in popular series such as “McCloud”, “The Rookies” and “Switch”. In 1976 Jaclyn starred as Kelly Garrett on “Charlie’s Angels” and was the only actor to continue with the series for its five year network run. Following “Charlie’s Angels” Jaclyn earned a Golden Globe nomination for her critically acclaimed portrayal of the legendary first lady in “Jacqueline Bouvier Kennedy”, one of the most highly rated telefilms of all time. Frequently called the “Queen of Mini-Series”, Jaclyn starred in such well received mini-series as, “Rage of Angels”, “George Washington”, “Rage of Angels: The Story Continues”, “The Bourne Identity” and “Family Album”. One of her favorite roles was the title character in “Florence Nightengale”. Notably, Jaclyn has compiled an impressive filmography of more than 50 films and TV appearances. In 1989 Jaclyn was honored with a star on the world famous Hollywood Walk of Fame. Jaclyn co-starred in the CBS drama, "The District" portraying DA Vanessa Cavanaugh, has appeared on episodes of “Faith and Hope” and stared as Judge Kay Woodbury in Hallmark’s production of “Ordinary Miracles”, which aired in May 2005. Her show stopping appearance on the 2006 Emmy telecast led Bravo TV’s producers to cast Jaclyn as the celebrity host of Bravo’s weekly competitive reality series, “Shear Genius”, which aired in March, 2007. and Season 2 in June 2008. More recently Jaclyn appeared on NBC’s ‘Law and Order SVU’ CBS’s ‘CSI: Crime Scene Investigation’ and in Hallmark’s new movie “Bridal Waves”. In 1985 Jaclyn entered the business world with the introduction of her collection of women's apparel and accessories for Kmart stores. She pioneered the concept of celebrities developing their own Brands rather than merely endorsing others. Since that time more than 100 million women have purchased clothing or accessories bearing her name. Awareness of the Jaclyn Smith name and brand by women 35-60 years of age is currently higher than 80% making her one of the best recognized people in America. Industry authority Woman’s Wear Daily reported that the signature Jaclyn Smith line had the highest consumer awareness of any private label apparel brand in the country. According market research, Jaclyn ranks in the top quartile of celebrity personas, on level with Ralph Lauren and Walt Disney. Jaclyn scores equally high with both men and women, has essentially no negatives, and is known not only for beauty, elegance and class, but is trustworthy and someone people aspire to be. With her sincere desire to help consumers attain beautiful home décor at an affordable price, Jaclyn began working with one of the world's largest home textile wholesalers, Trend /Fabricut on an exclusive fabric and trimming program in February 2007. In September 2008 Jaclyn launched her new line of bed and bath decor at Kmart and has since introduced outdoor living, home furnishings and seasonal items. The items bearing her name reflect many of the inspiring details and exceptional design of furnishings and accessories found in her personal collection and her exceptional eye for detail translates effortlessly to timeless designs. 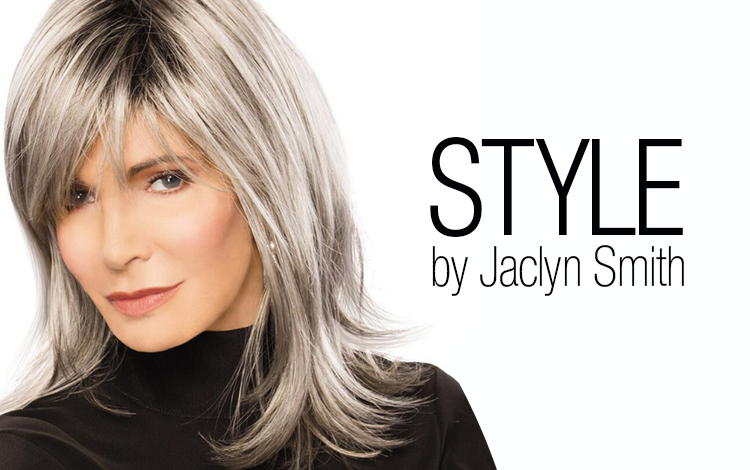 Along with her long time friend and famed celebrity hair stylist, José Eber, Jaclyn created a new collection of hair fashions, STYLE by Jaclyn Smith in partnership with Paula Young which launched in October 2008. In 2010 Jaclyn collaborated with her husband, Dr. Brad Allen, a renowned medical researcher, to develop a family of luxurious cleansers and moisturizers, and protective skin care products to work with her straightforward daily regimen – and to work in perfect concert with each other. It is perhaps the dancer’s sense of balance which keeps the many facets of her life in harmony. Husband Brad, son Gaston Anthony and daughter Spencer Margaret, keep her centered and serve as her inspiration. “That’s truly where my heart lies”. From the very beginning of Jaclyn's television career, she instantly became a fashion and beauty icon, winning hearts and households across America. To this day, Jaclyn's prolific media appearance, interviews and public relations, ensure that her brands continue to be praiseworthy, successful and timeless.